With the Syrian civil war well into its fourth year, it is apparent that political and militia dynamics that have developed with Syria's main minorities (in this analysis, excluding the Kurds)- namely, Alawites, Druze and Christians- have largely remained unchanged and if anything have only solidified. With the Alawites and Druze, political and military dynamics are still largely slanted towards the Assad regime, whose perceived protector status has only been enhanced with the large-scale territorial gains of the Islamic State across eastern Syria. For the Christians, the geographic splits that I documented previously have similarly remained in place. For Alawites, beyond the regular Syrian Arab Army, two of the other main outlets for enlisting in the fight against the rebels are the National Defense Force (NDF) and the Muqawama Suriya, the latter of which I previously profiled here. 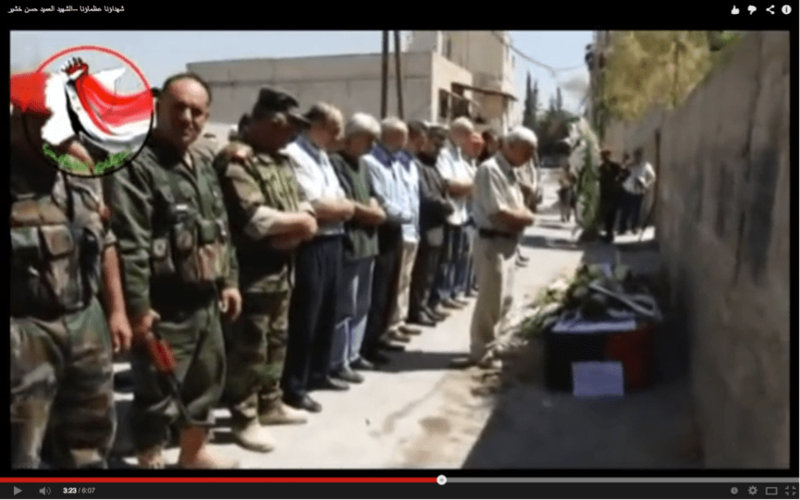 The NDF has engaged in superficial cross-sectarian messaging, as was most apparent in a funeral video for an NDF commander in the Aleppo area released last year in which those praying over the coffin can be observed to be doing so in a variety of ways: at least superficially, in both the Shi'a and Sunni manner. Prayer scene for deceased NDF commander Hassan Khashir. Video released in November 2013. Of course, multiple dynamics could be at work here: for example the impact of the Assad dynasty's "Sunnification" policies on Alawites, that some Alawites identified themselves more closely with regular Twelver Shi'ism, and the fact that some Sunnis from the Aleppo area have indeed been recruited to regime forces out of dislike and disillusionment with the rebels. 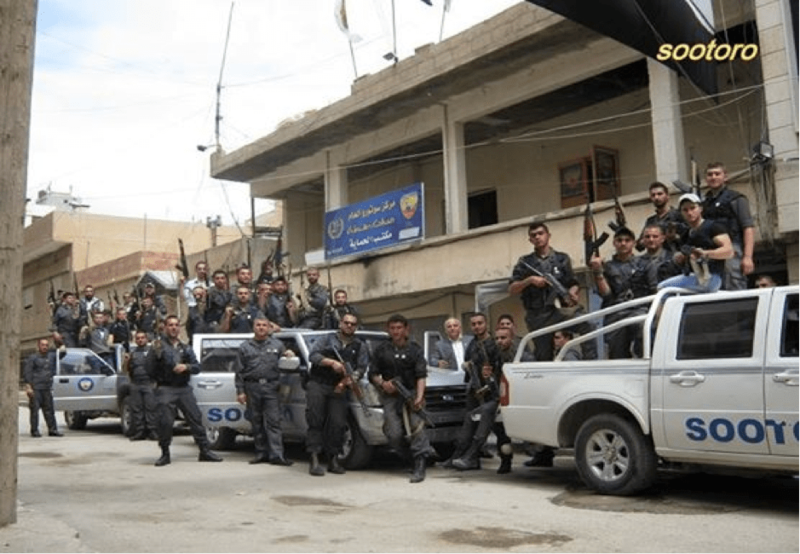 Regardless, the attempt at cross-sectarian appeal is there, but overall the NDF remains a predominantly Alawite force, as reporting by Sam Dagher on the ground has noted. 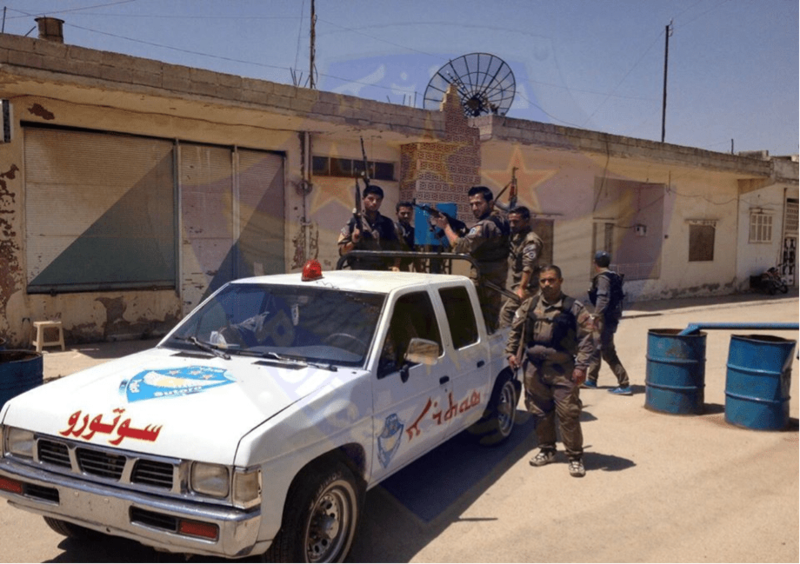 Not everywhere is the NDF an organized 'counter-insurgency' force: in Raqqa province for example NDF is more of a banner for remnant regime loyalists, despite lacking meaningful manpower to launch a serious ground offensive to retake IS-held territory. Meanwhile, the Muqawama Suriya has somewhat expanded its role beyond mere defense of Alawite and Twelver Shi'a areas (the latter most notably including Nubl and Zahara', as I reported last year), above all in Aleppo province, where it is known to have a presence in the Safira area in the countryside and has also participated in the fighting within Aleppo city, claiming a "martyr" in early March with one Muhammad Sakhr al-Khozai'e, said to have been part of the "Badr Organization" affiliated with the Muqawama Suriya in the Aleppo area. Muqawama Suriya claims its fighters posing with corpses of dead rebels in the al-Safira area of Aleppo province. Photo released in May. 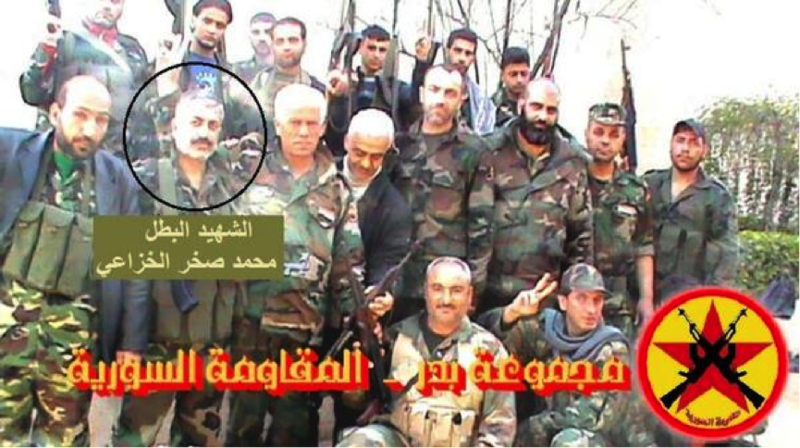 Muhammad Sakhr al-Khozaie pictured with the Muqawama Suriya's Aleppo contingent "Badr Organization." 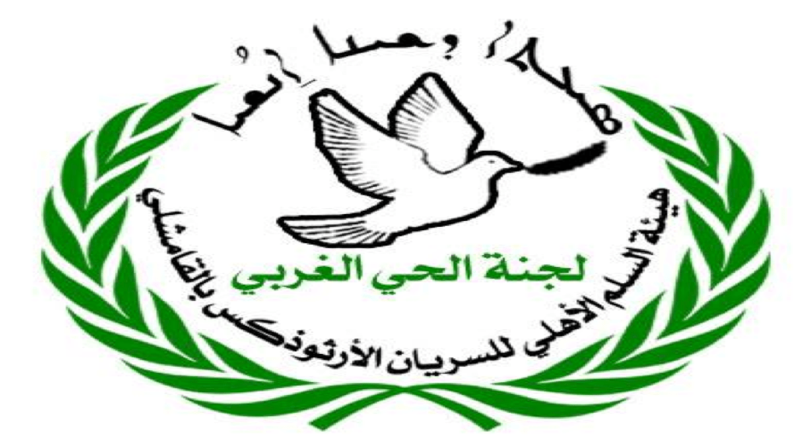 It might seem at first that this "Badr Organization's" name is based on Iraq's Badr Organization that has deployed fighters to Syria (which I initially thought), but firstly we should note the difference in Arabic wording: majmua Badr for the Muqawama Suriya's wing as opposed to Iraq's manẓama Badr, and secondly, it turns out Badr is merely the name of the local contingent's leader's new-born son. The Muqawama Suriya publicized Khozai'e's funeral within Aleppo city. In the video of Khozaie's funeral, it is affirmed by one of the speakers that the Muqawama Suriya is "defending the land and the homeland from Latakia to Homs and Damascus and now in Aleppo." 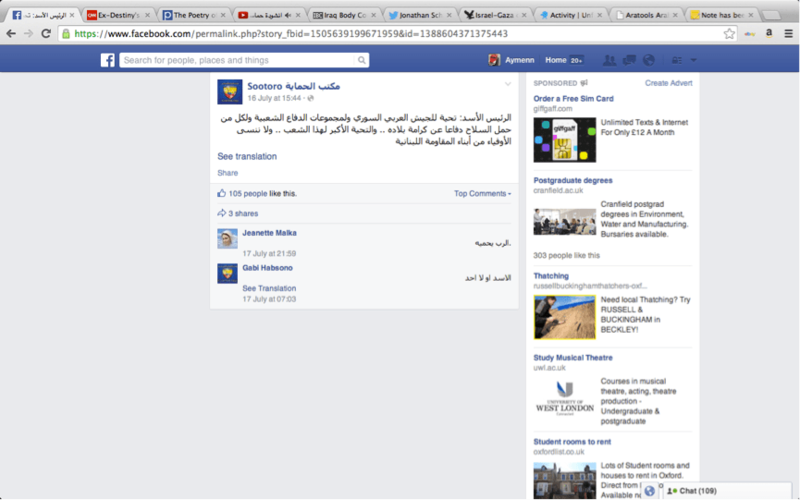 As ever, the Muqawama Suriya video invokes typical rhetoric about fighting a "Zionist" enemy/agent. It will be of interest to continue to watch how the Muqawama Suriya's role develops, if at all, given the centrality of the battle of Aleppo in the struggle between the regime and non-IS rebels. The data do not mean that there is no Alawite resentment against the regime- for example, the perception that the regime has brought the community as a whole into a terrible predicament- but there is too little evidence to suggest a real, substantial turn against the regime just yet. What I wrote in November 2013- namely, that the majority of Druze who have taken up arms have done so on the side of the regime- remains true today despite the superficial outreach to the isolated Druze communities in Idlib by Jamal Ma'aruf of the Syrian Revolutionaries Front. The main difference now is the evolution of local NDF branches in Druze areas where "popular/people's committees" had existed. 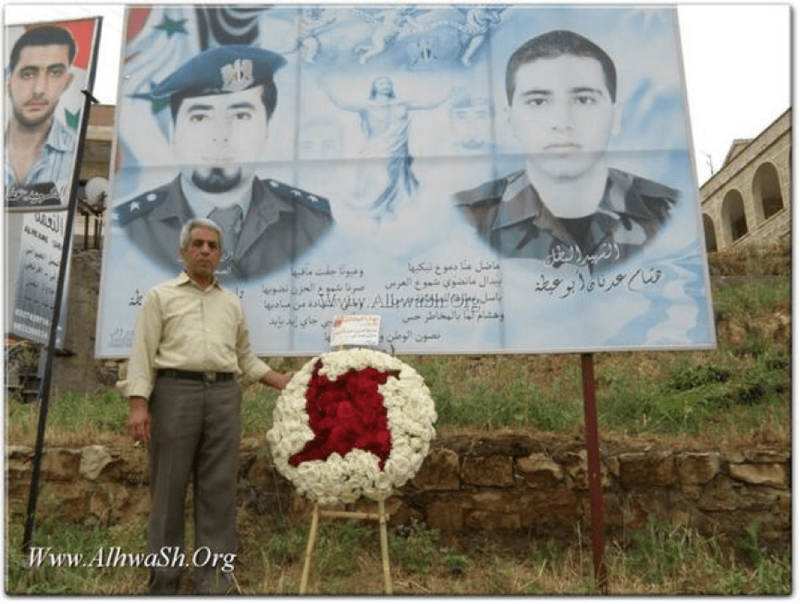 An example is the Druze village of Haḍr in Jabal al-Sheikh, which in recent months erected a small mural dedicated to those who have died fighting for the army and NDF. 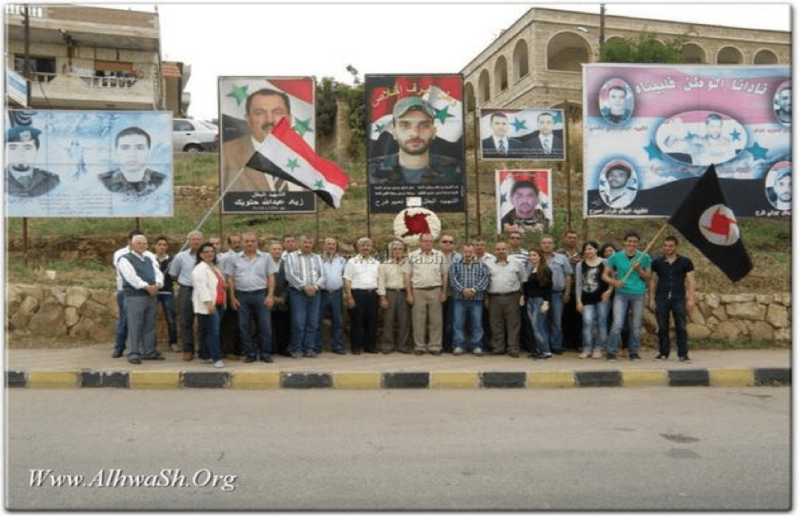 Locals gather in the Druze village of Haḍr to commemorate those depicted on the tree mural who have died fighting for the army and NDF. Mural in the Suwayda village of al-Raha dedicated to those who have died fighting for the regime or were killed by rebels/in crossfire. Druze militiaman keeps guard, supposedly in Arna, Jabal al-Sheikh. Arna has featured recruits to regime forces, and there should be no illusions of a Druze autonomist trend here rejecting the regime yet. 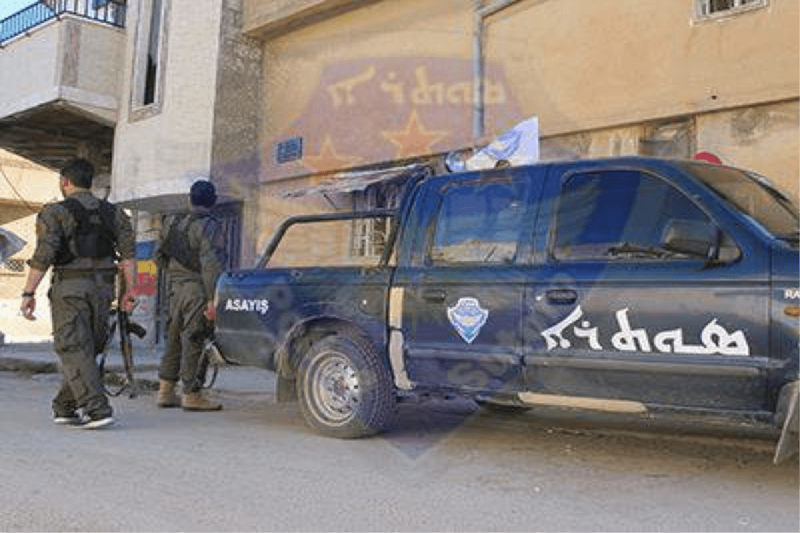 Druze militiamen go under a variety of banners- such as "Forces of Abu Ibrahim" or "Jaysh al-Muwahhideen" but nothing suggests these militias are independent of regime organization. 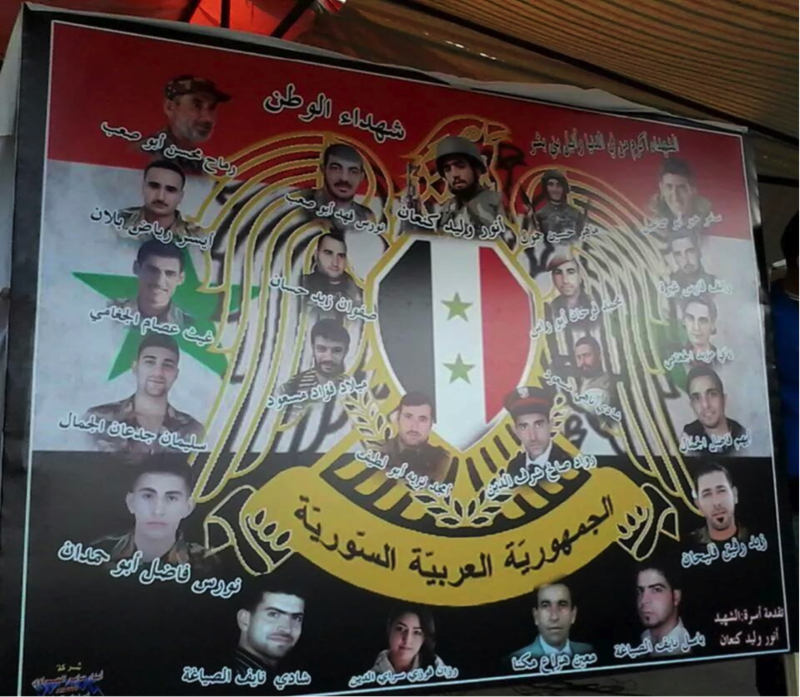 Advertisements for "martyrdoms" of Druze soldiers from Suwayda governorate and the Damascus locality of Jaramana continue unabated, illustrating that there still appears to be little resistance to conscription or taking up arms with the regime. 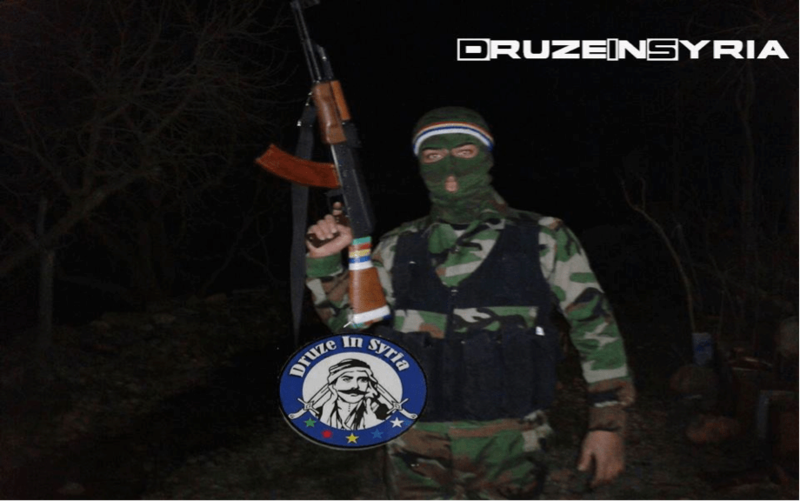 I emphasize that I have indeed documented the exceptions, but they remain exceptions, and instances of other sources claiming a substantial Druze presence among the rebels- such as social media activist "Jad Bantha" who is not actually based in Syria- remain unreliable. Shadi Hamid Abu Ismail, killed on 7 July in Wadi al-Deif, Idlib province. 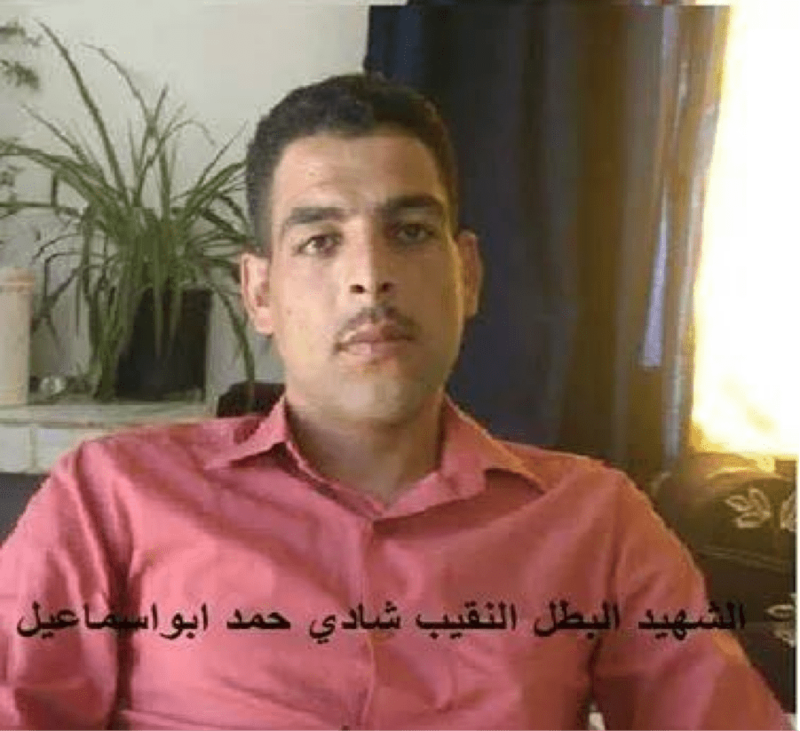 Mu'nis al-Halabi, a Druze soldier from al-Khalidiya (Suwayda province) killed in al-Mleha on 7 June. 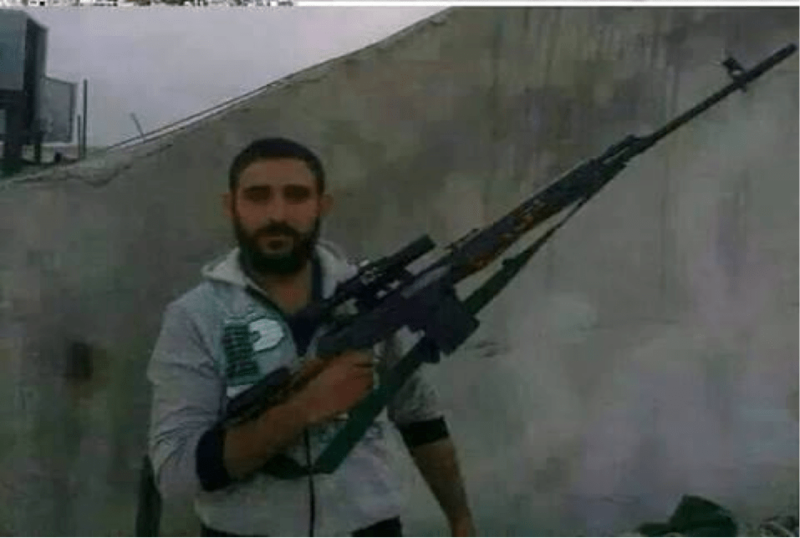 Rawad Sharf al-Din, from the Jabal al-Sheikh village of Rime killed in the fight for Deraa prison. 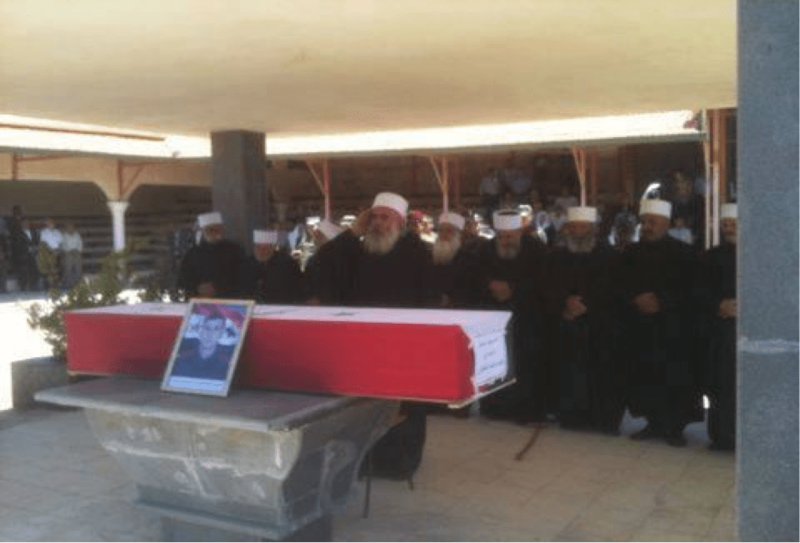 Druze sheikhs mourn for Adham al-Safdi, killed fighting for the Syrian army in Deraa on 23 May 2014. 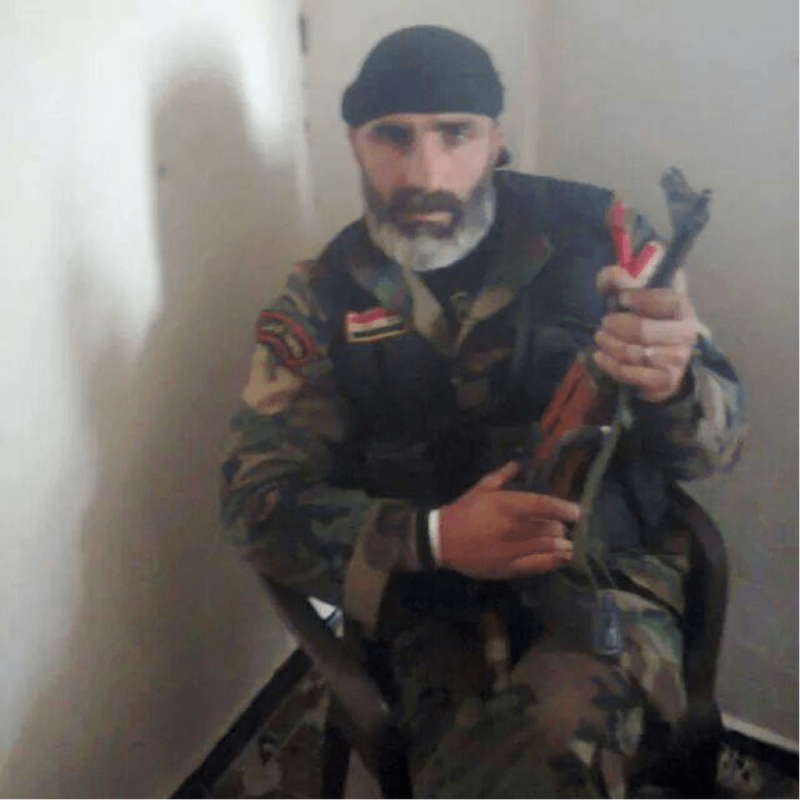 Aamer Fayez al-Basha, an NDF fighter from the Suwayda village of Sumayd killed on 28May in al-Mleha, East Ghouta. 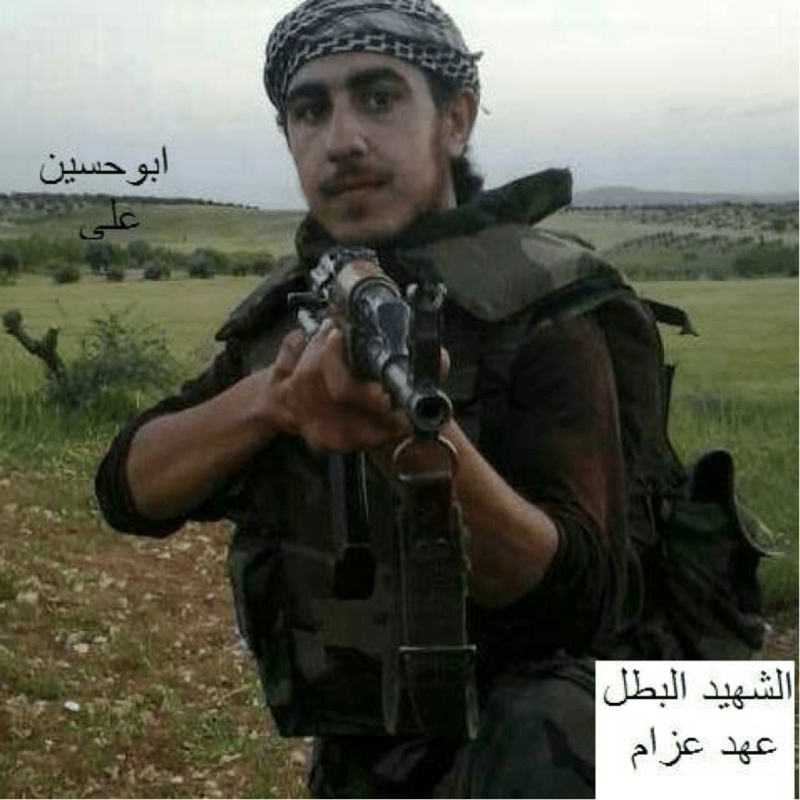 Ahad Azzam from the Suwayda village of Ta'arah who died fighting in Idlib on 3 June. Fadi Hamza Hamsho from the village of Lahitha in Suwayda province, killed in al-Mleha in early June. The Christians still remain the most complex group of the Syrian minorities documented here. Out in the west of the country, the army and NDF still have Christian recruits, but a more interesting dynamic is the attraction for some Christians of the fascist Syrian Social Nationalist Party (SSNP), which appears to have developed its own militias in Homs governorate that haveclashed with the NDF. 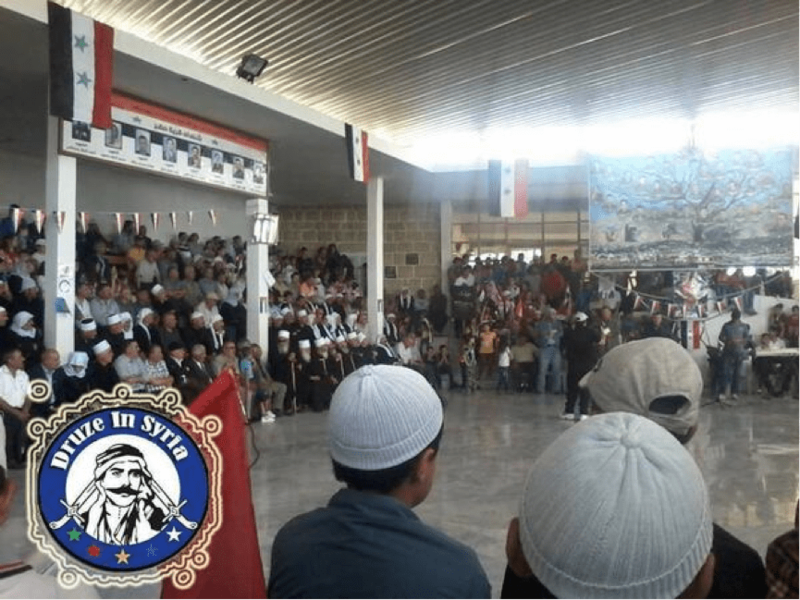 As I showed in my November 2013 article on the Druze, membership of the SSNP and the regular armed forces is not mutually exclusive, but these localized dynamics in Homs governorate illustrate the wider problem I pointed to in my profile of the Muqawama Suriya of the regime's inability in the long-run to be able to rein in irregular forces. Support for the SSNP in the town of al-Hwash in Wadi al-Nasara, Homs province, along with commemoration of Christian fighters who have died fighting the rebels. Locals in al-Hwash show support for the SSNP. 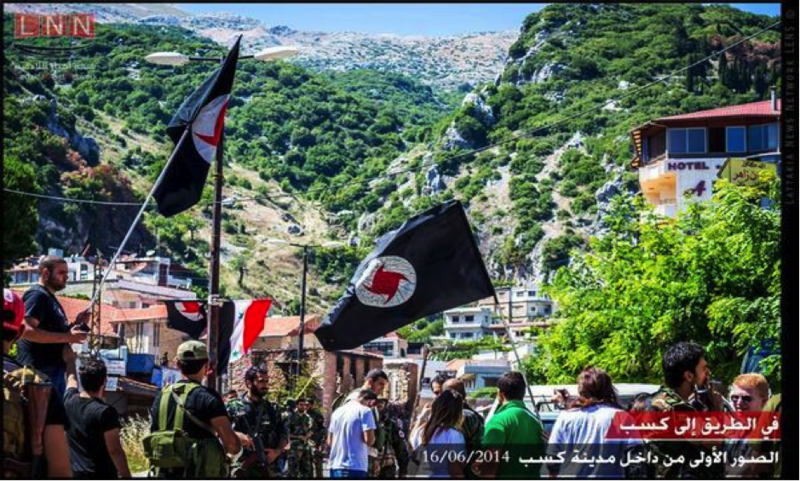 In keeping with this local Christian support for the SSNP, the SSNP has also been keen to put out solidarity messaging with Christians, illustrated most recently by a visit to the town of Kasab that was taken in a jihadi-spearheaded offensive in March. Kasab was recaptured by a variety of pro-regime forces in mid-June, such as the Muqawama Suriya, the NDF, the Ba'ath Brigades, and Suqur al-Sahara (which I first profiled here). "On the road to Kasab: the first photos from inside the town of Kasab, 16 June." Visit featuring SSNP supporters. 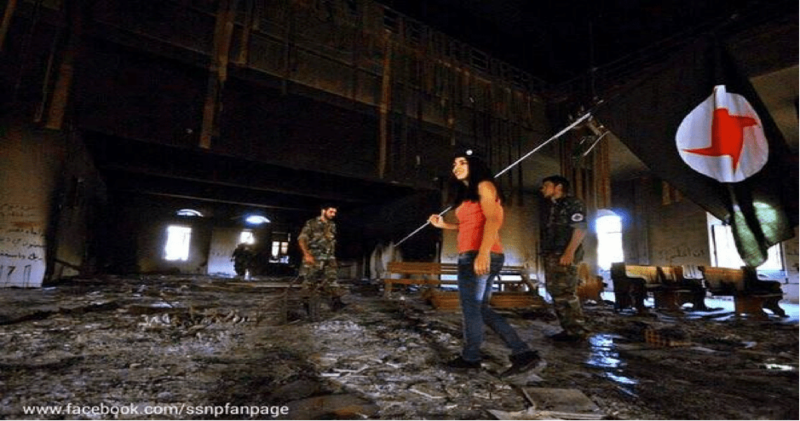 SSNP members and supporters visit a damaged and desecrated church in Kasab. The proof is not 100% that this was necessarily the work of the rebels who were in the town, and much of the debate about how the churches would be treated was subject to the controversy on social media surrounding Kim Kardashian's tweets, which certainly went too far in calling a 'genocide' against Christians. However, the pattern of rebels' desecrating churches with the ruins discovered post-withdrawal fits a pattern observed in Yabroud and other locations. In any case, the situation was not helped by those cheering for the rebel offensive on Kasab despite the fact it was spearheaded by foreign jihadis. "The administration and members of the Sootoro protection office congratulate Mr. President Bashar Hafez al-Assad on winning the presidential elections, asking the Almighty Lord that this presidential period be a period of security, peace and blossoming for Syria and all Syrians…"
Qamishli Sootoro graphic: "We have vowed resistance and defense of the people and the homeland," featuring the flag of the Assad regime and echoing the regime's rhetoric. The Qamishli Sootoro advertises a message from "President Assad: Salutations to the SAA and the People's Defense Organizations and all bearing weapons to defend the dignity of their homeland…and the greatest salutation is to this people…and we do not forget those who have died from the sons of the Lebanese resistance." "Here we would like to inform you that these repeated acts of behavior by members of the SUP are indicative of childish conduct that has begun having a great influence on the presence of the sons of our people in their historical areas and the latest of these acts- the taking a 10% slice of agricultural crops and the following method of distortion of principles by their media- has had a great influence on the migration of the sons of our people and the abandonment of their lands. We conclude by indicating our total rejection of these acts of behavior…[but despite this] we insist on the prevention of infighting between brothers that we had agreed on recently under the supervision of Christian Civil Peace Committee in Qamishli (also despite the repeated acts of abuse by Sutoro-Asayish)." SUP Sutoro in al-Malikiya, Hasakah province. SUP Sutoro member mans a checkpoint. SUP Sutoro vehicle. 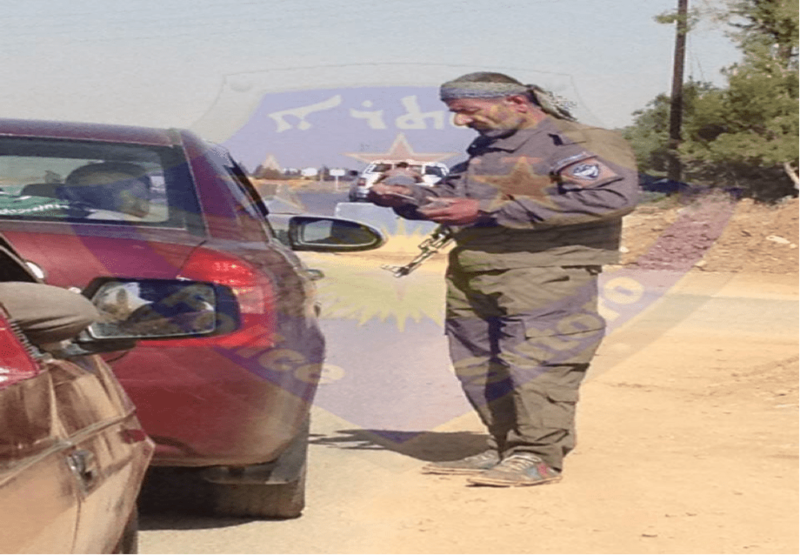 Note "Asayish" is also on the vehicle, indicating the integration of the SUP's forces into the PYD's security apparatus. 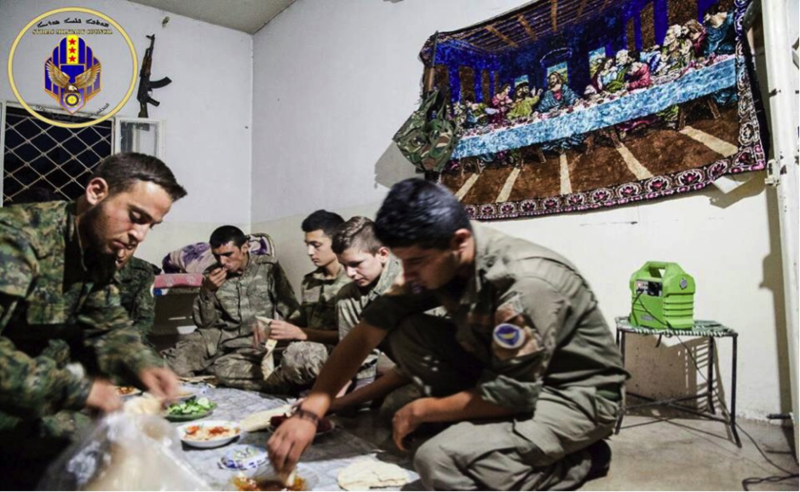 Syriac Military Council and Sutoro members share food. The Christian Civil Peace Committee- also known as the Syriac-Orthodox Civil Peace Committee in Qamishli- is a nominally neutral organization to which the Qamishli Sootoro is affiliated but is in fact linked with the regime. The use of the general moniker "Christian" here in the Qamishli Sootoro statement to refer to the committee indicates one messaging strategy used by the group since December 2013, when Qamishli Sootoro indicated intentions to open up new branches and expand, whereby no distinctions would be made among Christian church affiliations within the Syriac-language liturgy as regards provision of protection. 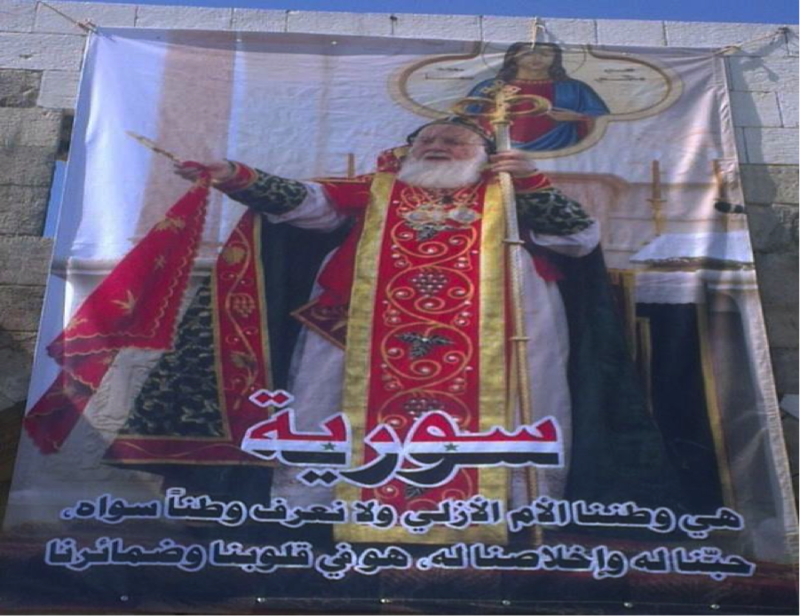 The insistence on an anti-infighting stance is also noteworthy because this image has been the official presentation in Qamishli since at least the start of this year: namely, despite the political split, all those working under the name of Sutoro/Sootoro should at least strive to work together for the common cause of protecting Christians. Like many 'brotherology' images, this should of course be taken with a pinch of salt. Syriac Orthodox Civil Peace Committee in Qamishli, Western Quarter branch. Graphic shared by the Syriac Orthodox Civil Peace Committee in Qamishli: "Syria is our eternal motherland and we know no homeland besides it. Our love for it and our loyalty to it is in our hearts and souls." The question now arises of who is winning in the competition between the two brands for the leading status of protector of Syria's northeast Christians. The evidence would seem to suggest that the SUP Sutoro has the upper hand. This is due to the fact that the PYD's power has steadily grown over the past year at the expense of the regime's influence, and the SUP has essentially backed the winning horse in the wider competition for power in the northeast. Indeed, lacking manpower more generally, Assad regime-aligned forces in wider eastern Syria have already shown themselves inept at dealing with the Islamic State's onslaughts. Meanwhile, little points to any meaningful fulfillment of the Qamishli Sootoro's plans from the end of last year to expand beyond Qamishli, at least partly on account of financial difficulties. 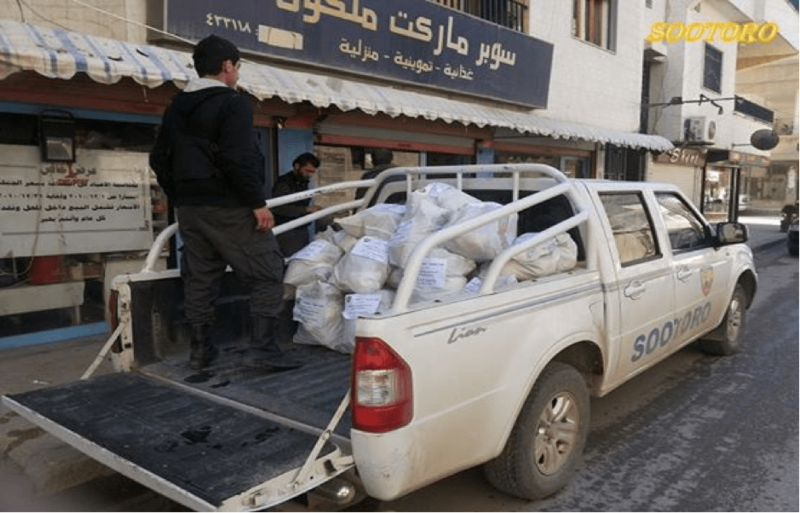 The Qamishli Sootoro on more than one occasion has appealed or expressed thanks to donors living abroad for providing necessary resources for outreach or protection programs. The main factor that appears to persuade some Christians in the northeast of siding with the regime is fear of a "Kurdization" project by the PYD. 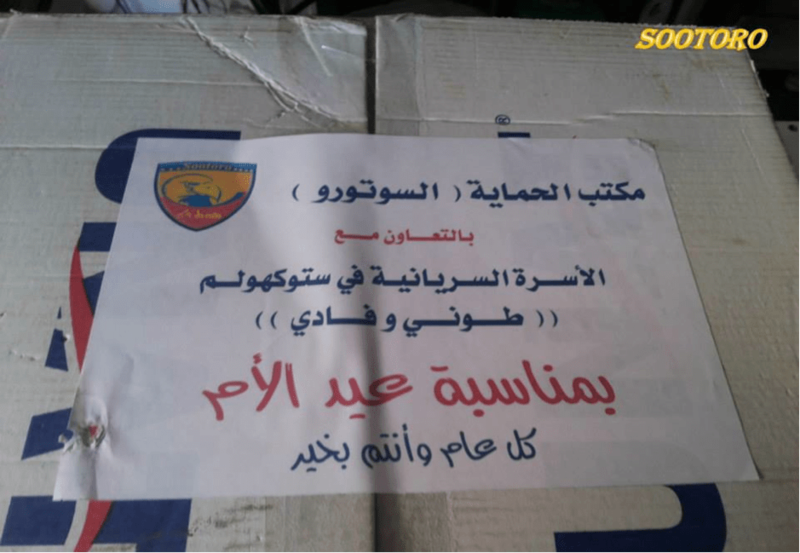 Qamishli Sootoro gifts distribution package for locals on Mother's Day in March 2014: "Sootoro Protection Office in cooperation with the Syriac family in Stockholm (Toni and Fadi) as regards Mother's Day." Sootoro truck ready to distribute gifts on Mother's Day in Qamishli. It can be seen that the trends among Syria's main minorities on the ground have yet to show any meaningful shift to the armed opposition, whatever minority members there may be in the opposition-in-exile, reflecting the level of detachment. The future points to the continuation of this general situation. The most important reason is the rise of the Islamic State, which has most notably imposed the second-class dhimmi pact on Christians in its areas of control. Besides the Jabhat al-Nusra emirate, there is also the "Jabhat Ansar al-Din" coalition announced by four jihadi factions- the Green Battalion, Jaysh al-Muhajireen wa al-Ansar, Harakat Sham al-Islam and Harakat Fajr al-Sham. Of these groups, the first is an independent faction in origin that simply did not wish to take sides in the Islamic State-al-Qa'ida dispute; the second is aligned with the Caucasus Emirate project; the third was founded as a virtual al-Qa'ida-front project by ex-Guantánamo detainee Ibrahim bin Shakaran but likely on account of his death in the Latakia offensive in the spring the group's direction has somewhat shifted away from that (in contrast to Suqur al-Izz, which has simply subsumed itself under Jabhat al-Nusra as I predicted and called out for months); and the fourth is a pro-Caliphate group primarily operating in Aleppo province. The situation is all particularly problematic for Alawites, in an environment where the disparaging word "Nusayri" has become quite normal in the insurgency, even among comparatively 'moderate' (as in, those groups with a clear national framework attitude) rebel coalitions like the Authenticity and Development Front. None of these developments can be seen as encouraging by minorities, and sadly indicate the continuation and aggravation of ethno-sectarian division in Syria for the foreseeable future.